A good first book by Sheron Wood McCartha. It's not too long, but it includes a plethora of different ideas all mixed together. There's time travel, psychic talents, political intrigue, romance, angels, and a fantasy world whose inhabitants are amazingly quick to pick up on modern technology. The author also throws in a number of names that are jokes; some are amusing like Meerschaum the inventor, and some are groaners like Jubi Lee the, er, madam. The King's advisor, Horatio Steele, gets a new kind of metal named after him. So this book would be a genre-bender where you just sit back and enjoy how the author brings all the elements together. That's not hard to do because the writing is very straightforward and easy to read. I've been told some of the elements in this book also get used in later books in the series, so I look forward to checking them out.While the dialogue that involves children isn't great, the dialogue between adults is well done, particularly during the scenes of dramatic interpersonal conflict (sorry, had to put it that way to avoid spoilers). In addition, I really enjoyed the political intrigue angle whenever it surfaced. The fantasy world was simple enough to be understood but varied enough to stay interesting. And the time travel was handled as multiple threads, under the theory that going back in time and changing the past changes that past's "future" (your present). Although the author took some care to label the time strands in the chapters that involved that changing future, I had no problems keeping up with it the way it was written in the text, which was nice.Disclaimer: I am friends with the author, although I've tried to be unbiased in this review. Note: I won this as part of Goodreads giveawayUnfortunately, I ended up extremely frustrated with this book. When I read a good novel, I become immersed in it, I see the places and I empathize with the characters. In this book, I felt absolutely no connection to the story or to the characters. People triumphed and despaired, hated and loved. And yet, I felt none of it. The author gave me information and it felt like INFORMATION, something that I was learning rather than feeling or seeing along with the characters.Part of that was due to the writing style. It attempted to provide information randomly, without giving any reason for said information. Say, for instance, that the king is trying to hold onto consciousness after being wounded while he tries to drive a carriage. His thoughts are dark as he thinks of his men who were slaughtered by the bandits that attacked him. Next thing I know, he goes into a two page exposition on market day and the goods that are found there. Then his thoughts jump to how his current desire as king is to build a golden spire. Are these items of information important or appropriate for the setting? (Be assured that if you heard me ask this question, my tone would indicate the answer should be a resounding no). It seems unnecessary and I want to know why this man is ruminating on his big gold spire and the fur in his marketplace when he is bleeding and aggravating his wound by bouncing around in a carriage. I would attribute this randomness of thought to the king’s current blood loss issue if he, along with the other characters in this novel, hadn’t already demonstrated similar mental patterns many (and when I say many, I mean *MANY*) times over. What this book needs is a good editor to ruthlessly cut unnecessary bits. Even then, however, I'm fairly certain I would not read this book again. There is something lacking in it that makes it difficult to enjoy or even appreciate. Science fiction time travel paired with medieval times in a high fantasy fashion. YASSSSSSSSSSSSSS. You have my undivided attention. This is a concept I can get behind. A combination of Doctor Who and The Butterfly Effect is what came to mind when reading this. And I liked it. Quite a bit.Rowyna Grae, of Sheron Wood McCartha's Caught in Time, is charged with the task of traveling back through time, as only she can through her carefully designed genetics, to ensure the best future possible. Thrown back in time, Rowyna has to think on her feet and do and say the right thing at the right time, but emotions affect her decisions and have her questioning every step she takes.To read this, and other book reviews, visit my website:http://jenpaul13.wix.com/makinggoodst....The story took place over a vast span of time (hehe. I like puns), yet it was paced rather quickly. I would tell myself: "Just this chapter and then you should probably go get something to eat." But then I got to the end of the chapter and I just kept reading to know how the story would unfold next. Food could wait for a while longer...like until the book was finished.In order to maintain the time travel aspect of the story, I thought that the interspersed Richard time line chapters were a great idea. Not to mention that it powerfully showed the ramifications of time travel and that all-important butterfly effect.There were some areas of grammatical editing issues, but for the most part, it could be overlooked as it happened only occasionally instead of consistently throughout the text.Overall, I'd give this a 4.5 out of 5 stars. Great Book I highly recommend this book. This was not my type of book prior to reading it. It is a very good book about time travel causing alternate futures, with very interesting characters.. I did not put it down until I finished the read. The author has a new fan. 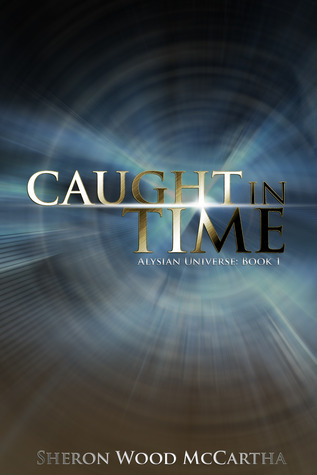 Caught in Time is a great first book from Sheron Wood McCartha. The blend of Science fiction and the epic fantasy backdrop make this a fun read. You will never be able to predict what happens to the characters in this story. Hold on to your hat! A great readCaught in time is a great read a clone goes back in time to fix the future. She ends up bringing future inventions with her to the past that make changes in the future not counted on. Caught in timeThis was a different kind of reading but it was interesting. In some spots was hard to understand what was going on . But I liked it was why I gave it a 5 star.different.